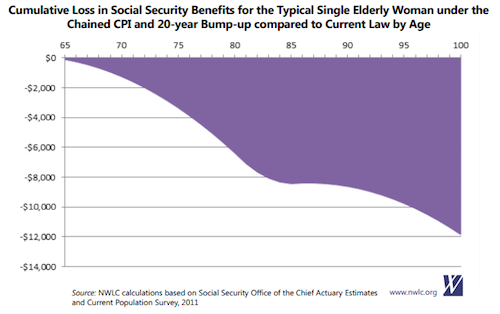 The chained CPI proposal in Obama's fiscal cliff offer will hurt impoverished elderly women. News is out today that a deal to avert the fiscal cliff is nigh. The New York Times is reporting that President Obama’s latest offer, which is close to Speaker Boehner’s dreams and desires, will permanently extend the Bush tax cuts on income below $400,000 and raise them above that bracket. In return, there will be spending cuts. One big component of those cuts is a change in how Social Security benefits are calculated, shifting to using the chained CPI. What sounds like a complex accounting measure will mean a serious benefit reduction for those who are elderly and impoverished. And guess who will get hit hardest? If your guess rhymes with schwomen, you’re correct. First, what is chained CPI? Currently Social Security benefits are adjusted to account for inflation, but there are many different measures of inflation. If the fiscal cliff deal includes a switch to a chained CPI, it will mean using a measure that tries to take into account human behavior in reaction to price increases—specifically, the substitution for something cheaper if the price of what you normally buy goes up. If provolone costs a fortune, perhaps I’ll switch to Swiss. Unfortunately for the elderly, they buy products that don’t behave much like provolone. As Dean Baker explains, the elderly spend more of their money on health care, which has seen costs far outpace the costs of cheese, and are also generally less likely to be able to make substitutions on what they buy. It should come as no surprise, then, that Social Security represents virtually the only source of income for nearly 40 percent of women over 80, compared to just 28 percent of men. If these women see their monthly checks slashed, where do they turn when they can’t afford food at the end of the month? This is not the only part of the impending deal that spells trouble for poor women. The Times also reports that it will include $100 billion in cuts to non-defense discretionary spending, or in other words, many vital domestic programs. But these programs have already been cut by $900 billion from laws enacted last year. 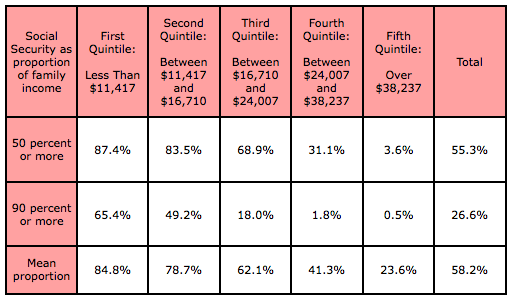 As I’ve previously written, this spending may sound abstract but represents lifelines for many low-income Americans. Women disproportionately rely on these programs, particularly those such as the Women, Infants and Children program, Head Start and child care assistance. The deal isn’t all bad news: Obama is still insisting on stimulus money and the extension of unemployment benefits, a recognition that we’re still grappling with a severe economic disaster. But poor women make for a pretty pathetic bargaining chip after an election in which women helped usher Obama to victory. Congress's deficit obsession is ignoring the real problem: unemployment. Check out William Greider's take here.